“Why would I ever write about that?” I asked. “To show the world that even travel blogger miss flights!” was his response. I definitely wasn’t ready to write about this for awhile, but I think I’ve finally come to terms with the embarrassing truth: it’s true – I missed a flight to Austin last year… while sitting at the gate in the airport. There goes my flight… without me. I recall the gate agent’s announcement that they were about to start the boarding process, but the next thing I knew the screen at the gate said “Boise.” Was I scatterbrained because I was running late for the flight? Was I a little tipsy from a pre-flight cocktail? Was I wearing headphones? The answer to all of those questions is “no.” I just flat out missed the flight. Okay, let me explain. I was totally consumed by a really good book. But really, I think the thing that got me was that the plane was a lot smaller than the ones that I normally go on, so the boarding process was much faster than normal. Seriously, the time it took between pre-boarding the “final call” (if there even was one) couldn’t have been more than five minutes. Like I said, I was AT THE GATE without headphones on – I’d seriously like to think that if they called my name for final boarding I would have heard it. Imagine it’s a day or two after your wedding. You’re basking in the afterglow of your perfect wedding weekend, and you’re trying not to check Facebook obsessively to see all of the photos that your friends have been posting. Now you’re en route to your dream honeymoon location. You took a sleeping pill before you boarded your plane, so the next thing you know you’re landing at your destination. 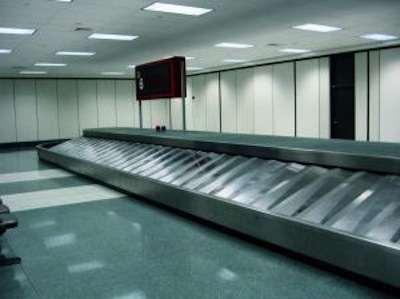 When you arrive at the baggage claim, it seems like it’s taking forever for your bags to appear because you just can’t wait to check into your hotel. The crowd around your baggage carousel begins to thin, and fewer and fewer pieces of luggage come down the shoot. Eventually, the carousel comes to a halt, and you still haven’t spotted your bags. Then the reality sinks in: your luggage is not there. Okay, let me stop myself right there before I cause any panic attacks. I know TONS of people who have gone on honeymoons, and literally NONE of them lost their luggage during those vacations. However, I unfortunately do know of this happening to plenty of people (myself included*) during non-honeymoon trips, so although it’s an unlikely scenario, it’s still important to know what to do if it happens to you. First things first, either you or your spouse needs to file a report with the airline to let them know your luggage is missing while the other one waits at the carousel in case any other bags from your flight were just really delayed. Make sure to get a file locator number from the airline, too! After several hours and lots of back and forth with the airline via Twitter, Wendy’s lost luggage fiasco had a happy ending. Twitter, of course, is a public forum that has the potential to reach millions of people, and airlines do not want to be badmouthed in front of such large audiences. Wendy said that even at 1:00 AM, she received better and more useful information from the airline via Twitter within three minutes than she was able to get after an hour at the airport. The Travel Channel’s Layover Guide has a fantastic suggestion: see if you can a one-day pass to your airline’s airport club. In addition to relaxing in a quiet space on comfortable furniture, you’ll probably get free food, wifi, and/or booze, depending on the airline. Recharge your electronics. 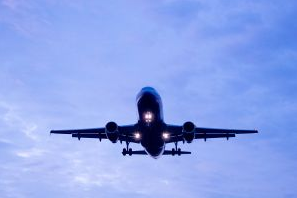 You won’t want your laptop/iPad/iPod’s batteries to die mid-flight. Exchange some currency. 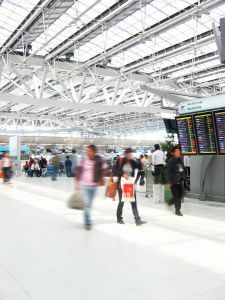 While the exchange rates at the airport may not be the best deal around, it’s a good idea to have some of the correct currency upon arrival. Walk around. This is probably a no-brainer to most of you for health reasons, but you never know what you may find while walking around an airport. For example, during a recent layover in Kuala Lumpur, my husband and I found a Harrods Tea Salon and shop. He had never been to the store in London before, so we killed the time sipping tea and eating sandwiches.